Based on the variations of sunspot numbers, we choose a 1-year interval at each solar minimum from the beginning of the acquisition of solar wind measurements in the ecliptic plane and at 1 AU. We take the period of July 2008 – June 2009 to represent the solar minimum between Solar Cycles 23 and 24. In comparison with the previous three minima, this solar minimum has the slowest, least dense, and coolest solar wind, and the weakest magnetic field. As a result, the solar wind dynamic pressure, dawn–dusk electric field, and geomagnetic activity during this minimum are the weakest among the four minima. The weakening trend had already appeared during solar minimum 22/23, and it may continue into the next solar minimum. During this minimum, the galactic cosmic ray intensity reached the highest level in the space age, while the number of solar energetic proton events and the ground level enhancement events were the least. 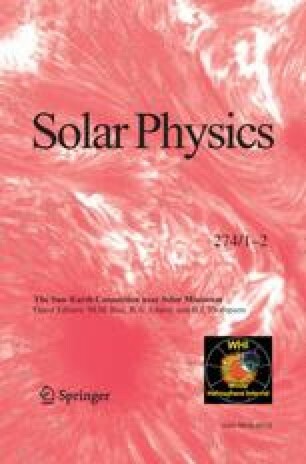 Using solar wind measurements near the Earth over 1995 – 2009, we have surveyed and characterized the large-scale solar wind structures, including fast-slow stream interaction regions (SIRs), interplanetary coronal mass ejections (ICMEs), and interplanetary shocks. Their solar cycle variations over the 15 years are studied comprehensively. In contrast with the previous minimum, we find that there are more SIRs and they recur more often during this minimum, probably because more low- and mid-latitude coronal holes and active regions emerged due to the weaker solar polar field than during the previous minimum. There are more shocks during this solar minimum, probably caused by the slower fast magnetosonic speed of the solar wind. The SIRs, ICMEs, and shocks during this minimum are generally weaker than during the previous minimum, but did not change as much as did the properties of the undisturbed solar wind. Guest Editors: M.M. Bisi, B.A. Emery, and B.J. Thompson. Smith, E.J., Balogh, A.: 2008, Geophys. Res. Lett. 35. doi: 10.1029/2008GL035345.